Whisk vinegar, oil, sugar, garlic, 1 teaspoon salt, and 1/2 teaspoon pepper together in large bowl. Add black-eyed peas, scallions, bell peppers, cucumber, cilantro, and parsley and toss to combine. Season with salt and pepper to taste. Let sit for at least 1 hour before serving. Salad will keep in the refrigerator for at five days. If you're looking for a vegetarian lasagna, this is not it. 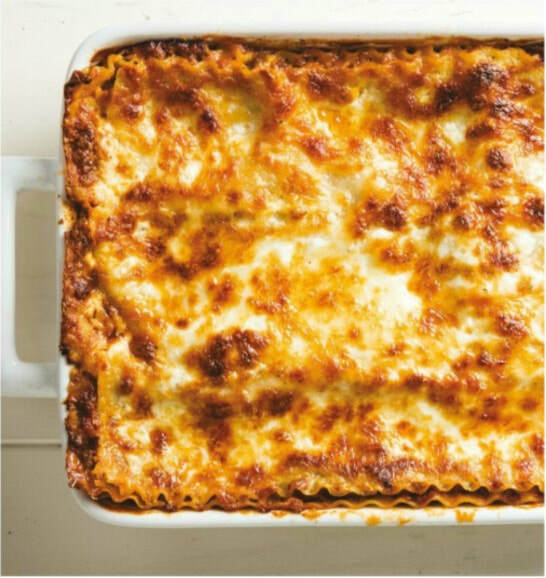 This lasagna is meaty, it's creamy, cheesy, and best of all, it has the crusty top that everyone seems to fight over for. Adjust oven rack to middle position and heat oven to 375 degrees. Spray rimmed baking sheet and 13 by 9-inch baking dish with oil spray. Bring 4 quarts water to boil in large Dutch oven. Add noodles and salt and cook, stirring often, until al dente. Drain noodles and transfer them to prepared sheet. 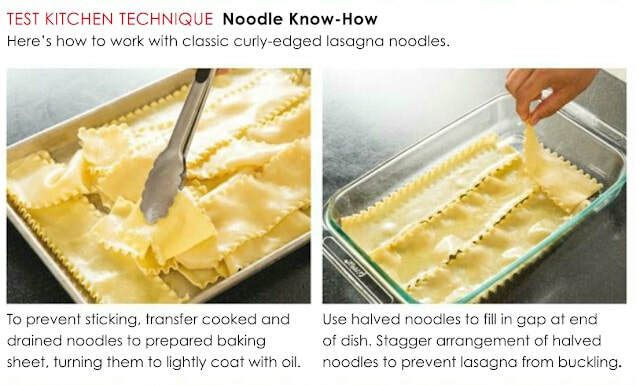 Using tongs, gently turn noodles to coat lightly with oil spray. Cut 2 noodles in halt crosswise. Mash bread and milk in bowl until smooth. Add beef, salt, and pepper and knead with your hands until well combined; set aside. Heat oil in now-empty Dutch oven over medium heat until shimmering. Add onion and cook until softened, about 5 minutes. Stir in garlic, oregano, and pepper flakes and cook until fragrant, about 1 minute. Add beef mixture, breaking meat into small pieces with wooden spoon, and cook until no longer pink, about 4 minutes. Stir in tomatoes and bring to simmer, scraping up any browned bits. Reduce heat to medium-low and simmer until flavors have melded, about 5 minutes. Whisk all ingredients in bowl until combined. Lay 3 noodles lengthwise in prepared dish with ends touching 1 short side of dish, leaving gap at far end. Lay 1 half noodle crosswise to fill gap (if needed). Spread 1½ cups meat sauce over noodles, followed by ½ cup cream sauce and finally ½ cup mozzarella. Repeat layering of noodles, meat sauce, cream sauce, and mozzarella 3 more times, switching position of half noodle to opposite end of dish each time. Lay remaining 3 noodles over top (there is no half noodle for top layer). Spread remaining cream sauce over noodles, followed by remain 1 cup mozzarella. Sprinkle pecorino over top. Spray sheet of aluminum foil with oil spray and cover lasagna. 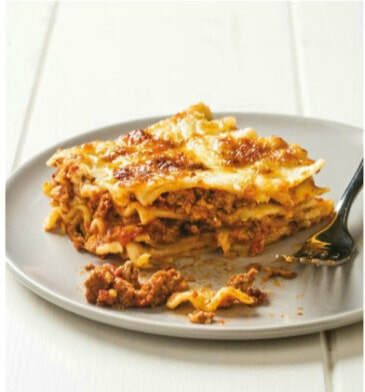 Set lasagna on rimmed baking sheet. Bake for 30 minutes. Discard foil and continue to bake until top layer of lasagna is spotty brown, 25 to 30 minutes longer. Let lasagna coo for 30 minutes. Slice and serve. ​At the end of step 7, cover dish with greased aluminum foil and refrigerate for up to 24 hours. When ready to eat, bake lasagna as directed in step 8, increasing covered baking time to 55 minutes. Oh my gosh! 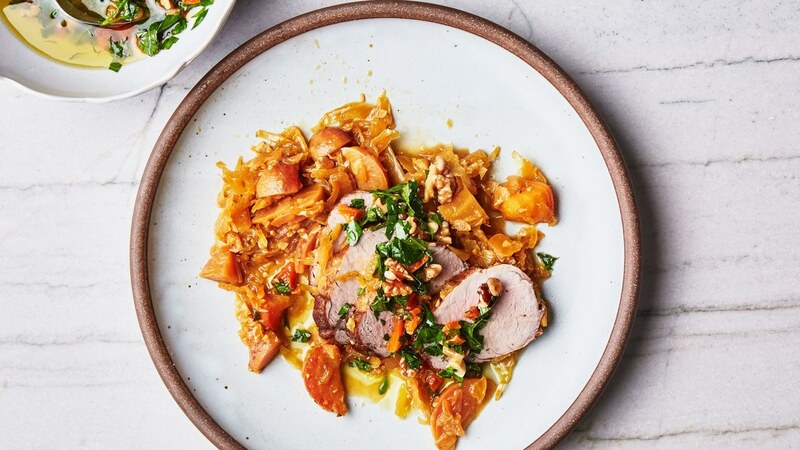 This recipe from Bon Appetit's October 2017 issue looks absolutely amazing! I can't wait to get my hands on some golden beets from the farmer's market, roast them up in the oven and prepare this dish! The original recipe calls for dried apricots but I'm thinking of substituting that with some dried cranberries to give the dish a nice pop of color. Preheat oven to 350°F. Toast walnuts on a rimmed baking sheet, tossing once, until golden brown, 7-10 minutes. Let cool, then chop. Heat 3 tablespoons of oil in a large skillet over medium-high. Season pork loin (look for on with a nice dark color and some fat on it) with salt and cook until browned on all sides, 10-15 minutes. Transfer pork to a platter. Add onions and beets to same skillet and cook, stirring often, until onions are slightly translucent and browned, 10-12 minutes; season with salt and pepper. Add garlic, sauerkraut, brine, broth, wine, and 2 tablespoons lemon juice and bring to a simmer. Cover skillet, reduce heat to low, and cook until beets are fork-tender, 25-30 minutes. 20-30 minutes. Transfer pork to a cutting board and let rest 5 minutes before slicing. Meanwhile, mix walnuts, mint, parsley, apricots, remaining 2 tablespoons lemon juice, and remaining 1/2 cup oil in a small bowl; season with salt and pepper. ​Spoon beet mixture onto plates and arrange sliced pork on top. Spoon a generous amount of walnut sauce over. My guests went to the kitchen hoping for seconds but were sadly disappointed when they saw an empty cast iron pot, still stained from the braising liquid, sitting on top of the stove. "No more?" some guests asked while looking at me with sad puppy eyes... "No more." I guess what I'm trying to say is that this recipe works! 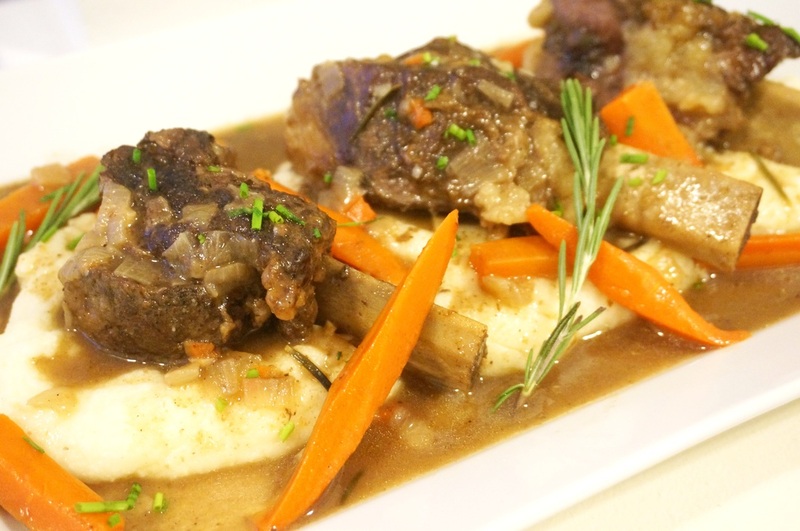 For the Christmas party that I was telling you about, I served appetizers (many of them), a pasta casserole (a large one), and several sides of vegetables but all that did not matter because what my guests really really wanted was the braised short ribs (much much more braised short ribs). 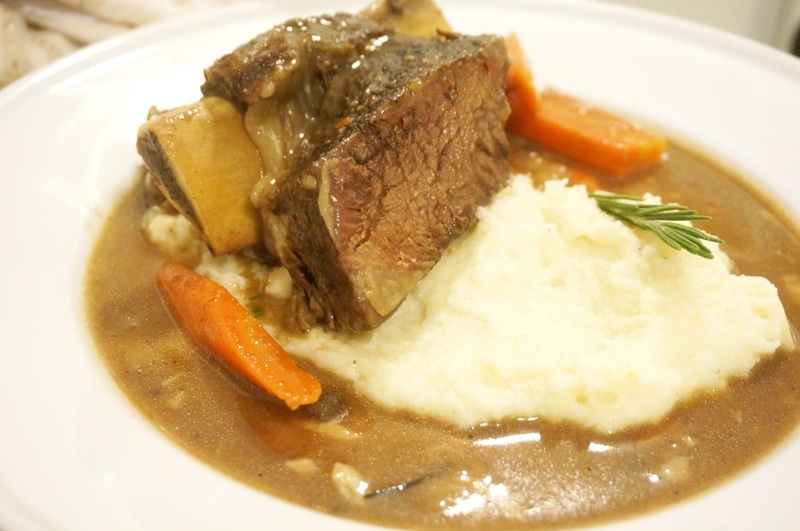 I recently made braised short ribs again. 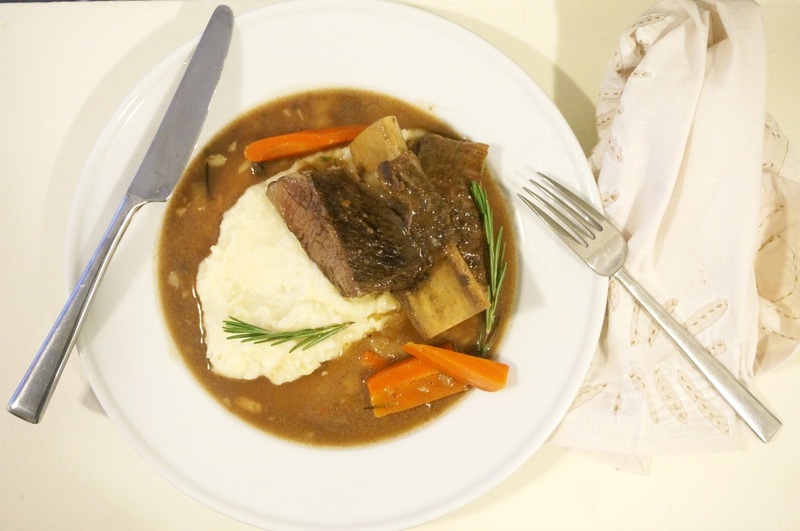 But this time, I used short ribs from grass-fed cows and homemade bone broth. And believe me when I tell you, the homemade bone broth makes them even better! As for the polenta, well, it was my first time making polenta and it was actually scary! When you read instructions on making polenta, they don't say "be prepared and wear safety gears!" but I will tell you, "BEWARE OF THE SPLATTER!" Even on low heat, the polenta kept on bubbling and splattering out from the pot! A few splats hit me on my hand and even my face! But everything is a learning experience and what I learned from making polenta is to always use the deepest pot you can find! Seriously, a 2-foot deep pot if you have one! Or use a pot lid as a shield! That way, the splattering polenta would have a harder time burning the bejesus out of you! Preheat oven to 325°F. In a Dutch oven, heat 2 tablespoons of oil over medium-high heat. Season the short ribs well with salt and pepper. In batches to avoid crowding, add the short ribs to the Dutch oven and cook, turning occasionally, until browned on all sides, 5 minutes per batch. Transfer to a plate. Add 1 tablespoon of oil to the Dutch oven and heat. Add the onion and carrots and stir occasionally, until the onion softens, about 4 minutes. Add the garlic and stir for about 1 minute. Sprinkle in the flour and stir well. Pour a little wine in the pot to deglaze the bottom of the pot. Make sure you scrape up all the brown bits on the bottom of the pot with a wooden spoon. Return the short ribs to the pot. Add the rest of the wine and the bone broth to the pot. Bring the liquid to a boil. Cover the pot and place in the oven for 2.5 hours. Transfer the ribs to a plate and tent with aluminum foil to keep warm. Let the cooking liquid stand for 5 minutes. Skim off the far from the surface and discard. Bring the liquid to a boil over high heat. Cook, stirring, until reduced by about one-forth, about 10 minutes. Discard the bay leaves. Scrape the brown stain of side of the pot and stir into the liquid – that stuff is very flavorful! 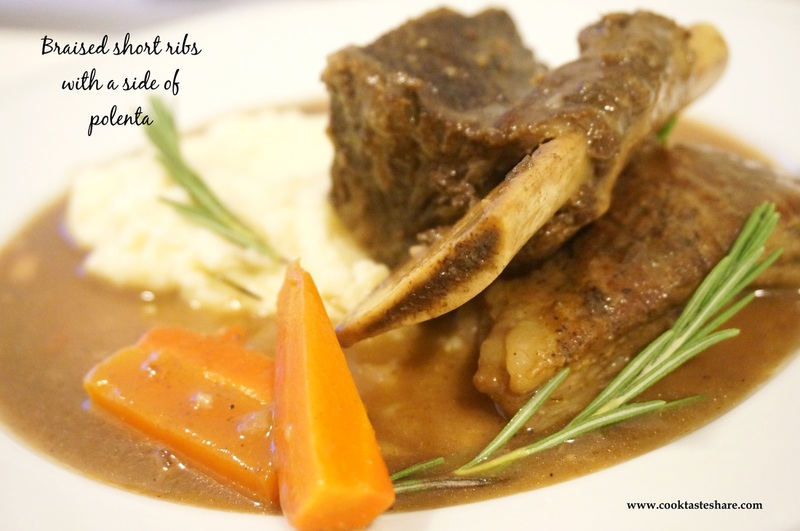 Return the short ribs to the pot. Just before serving, make the polenta. In a medium-size heavy saucepan, bring 5 cups of water to a boil. Add 1 teaspoon of salt. Pour cornmeal slowly into the water, stirring with a wire whisk. Continue stirring as mixture thickens, 3 minutes. *Be careful, the polenta will splatter! Turn heat to low. Cook for at least 45 minutes, stirring at least every 10 minutes. If polenta becomes too thick, think it will a little bit of water. Stir well and continue cooking. You can add up to 1 cup of water as necessary to keep polenta soft enough to stir. Add 6 tablespoons of butter to the polenta and stir until the butter is fully melted. 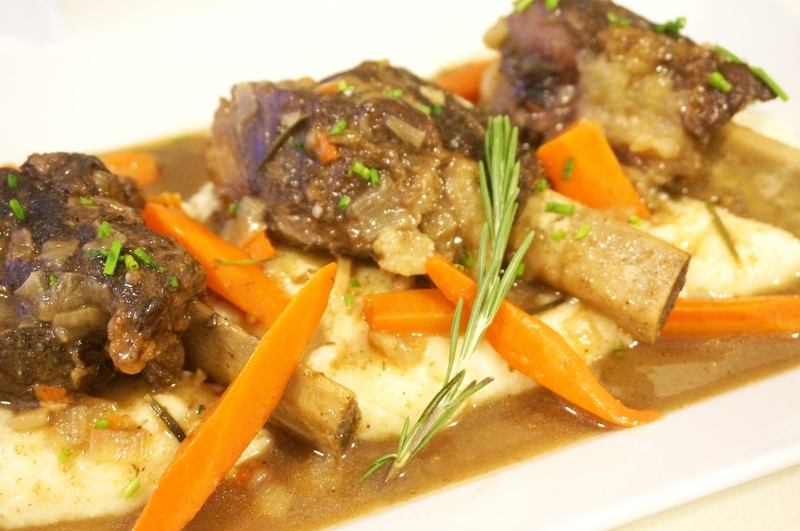 To serve, spoon polenta on plate, top with a 1 bone-in short rib, spoon braising liquid over and around the short rib, add carrots, and garnish with a small sprig of rosemary. 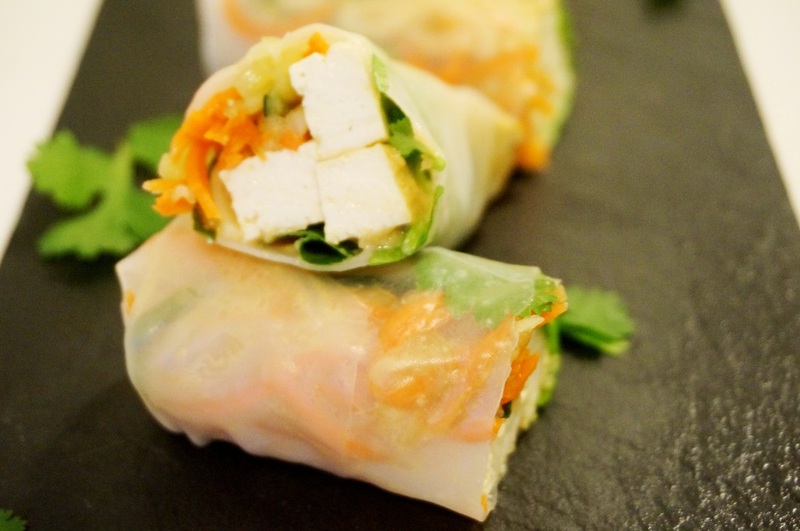 Tofu and Pickled Vegetables Summer Roll + A GIVEAWAY! Hi, everyone! This is the last post for the julienne peeler giveaway! So leave a comment because the giveaway ends this Sunday, March 15th, at 8pm. 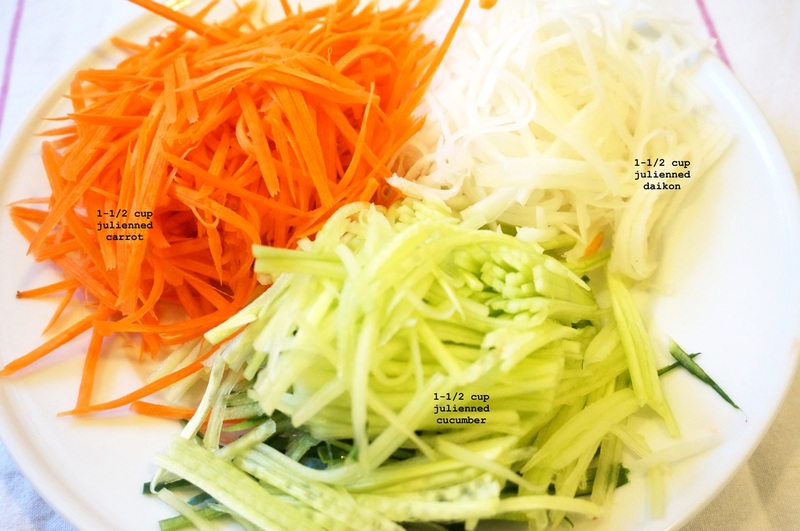 For extra chances to win, don't forget to check out and leave a comment on the Julienne Daikon with Smoked Salmon post and the Zucchini Noodles with a Mediterranean Bolognese Sauce post. Now let's talk about this Tofu and Pickled Vegetables Summer Roll. First off, you can put anything your heart desires in a summer roll. It's basically the asian version of a burrito! Just make sure whatever you choose to put in the roll has some texture because the rice paper wrap can be a little chewy so you will want to offset that chewiness by putting something crunchy in the roll. I used pickled vegetables for the crunch. Making the pickled vegetables is quite easy. Start with some julienned vegetables. Add salt, sugar, and vinegar, toss well, place it in the fridge and walk away! In the meantime, you can start on the tofu. When you buy tofu in a package like what I have here, the block of tofu is usually swimming in liquid. 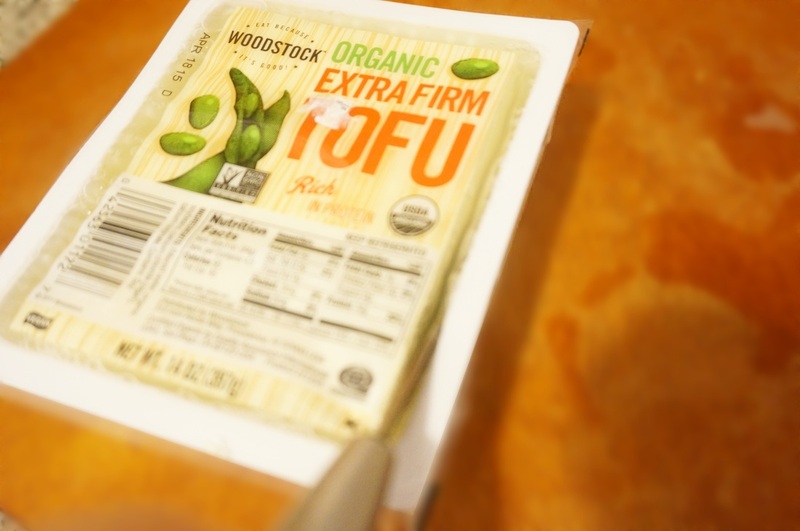 To easily drain the liquid, just make an incision on the side of the package, pour out the liquid and remove the tofu. 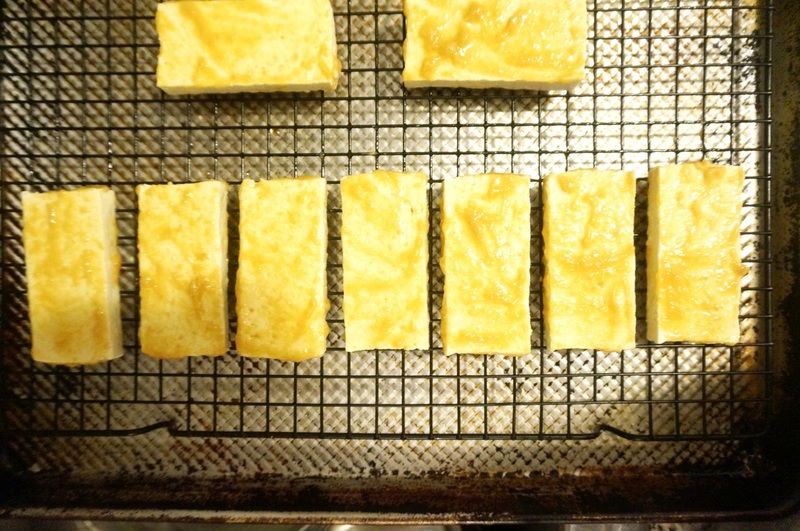 Cut the tofu widthwise into 1/2-inch slices and brush with a miso mixture. Bake the tofu for 30 minutes, flipping halfway through. 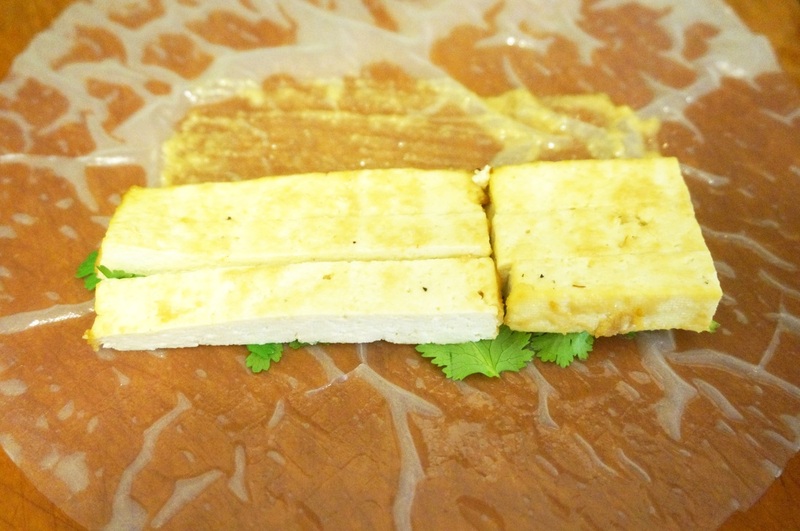 When the tofu is cooled, cut the slices into 3 strips. 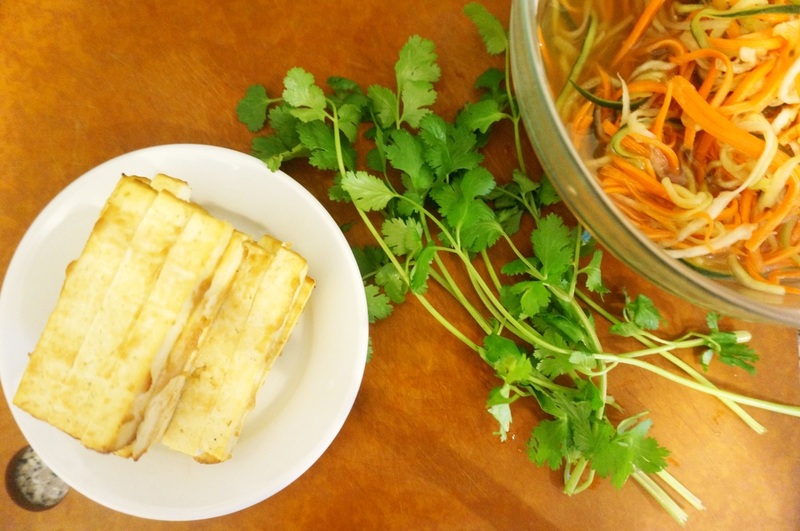 Grab some cilantro, the pickled vegetables, rice paper and some water and we are ready to make some summer rolls! Place your ingredients on the softened rice paper and wrap it up. Cut the roll in half and you are ready to eat! The great thing about this summer roll, or really any kind of summer roll, is that you can prepare almost all the ingredients ahead of time. 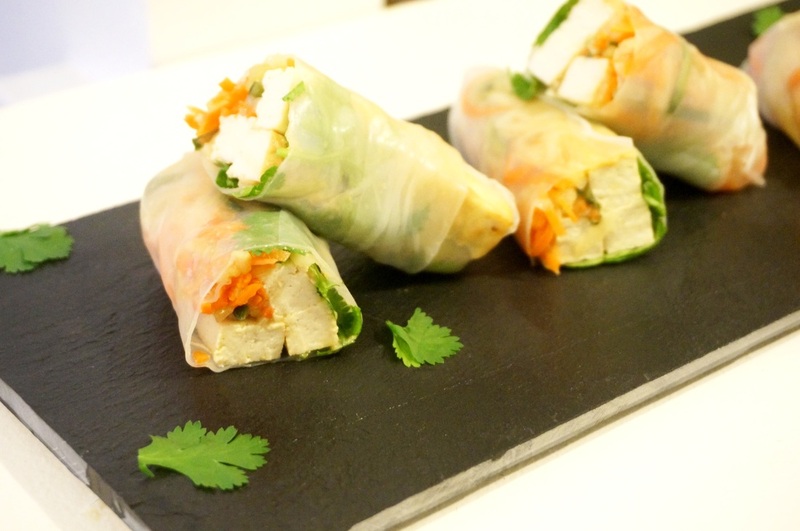 Simply keep the ingredients in the fridge and roll them up in rice paper when you're hungry and there you will have a delicious summer roll in no time! 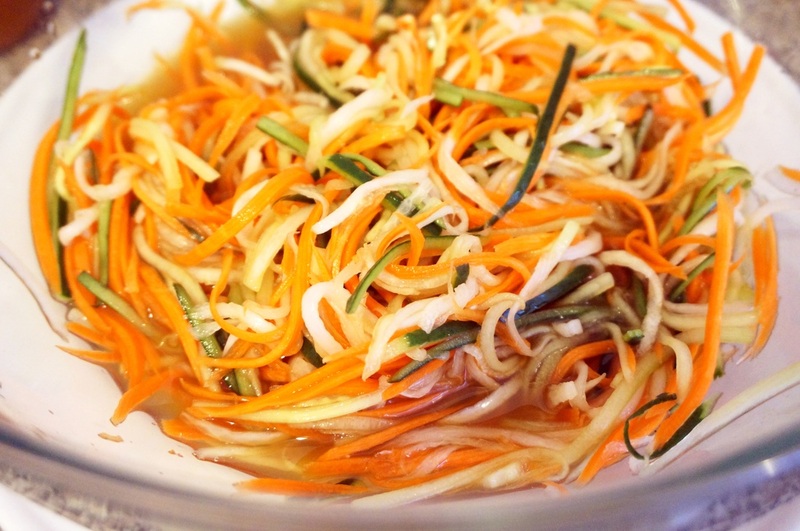 To make the pickled vegetables, put the julienned vegetables in a large mixing bowl. Sprinkle with salt palm sugar and toss well. Add rice vinegar, apple cider vinegar, and sherry wine vinegar and mix altogether. Transfer the vegetables and the pickle juice to a smaller non-reactive bowl, cover with plastic wrap and leave in the fridge for at least one hour, preferably overnight. To prepare the tofu for the summer roll, preheat the oven to 400°F. 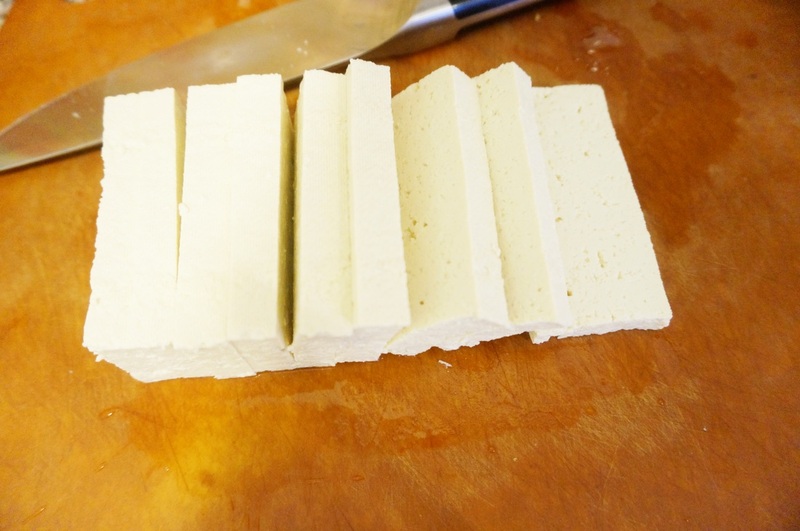 Remove the the block of tofu from the liquid and slice the tofu widthwise into 1/2-inch slices (you will get 9 slices). Mix miso and water in a small bowl. Slowly drizzle olive oil into the miso while mixing to emulsify the mixture. Take a pastry brush and brush the miso mixture onto one side of the tofu. Place a cooling rack on top of a baking sheet. Put the tofu on top of the cooling rack with miso brushed side down. Brush the other side with the miso mixture. You will have leftover miso mixture which we will use later. Bake the tofu for 30 minutes, flipping halfway through. Remove tofu from oven and allow to cool completely. 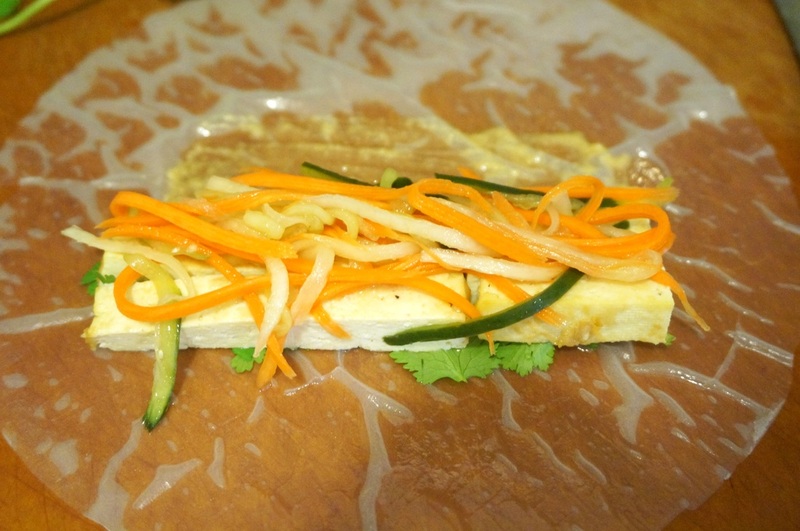 When the tofu is cooled, cut the slices into 3 strips. Take 9 strips of tofu and cut those in half again width wise. For the summer roll, you will use 3 full strips and 3 half strips of tofu (see picture above). To wrap, soften the rice paper according to manufacturer's instructions. 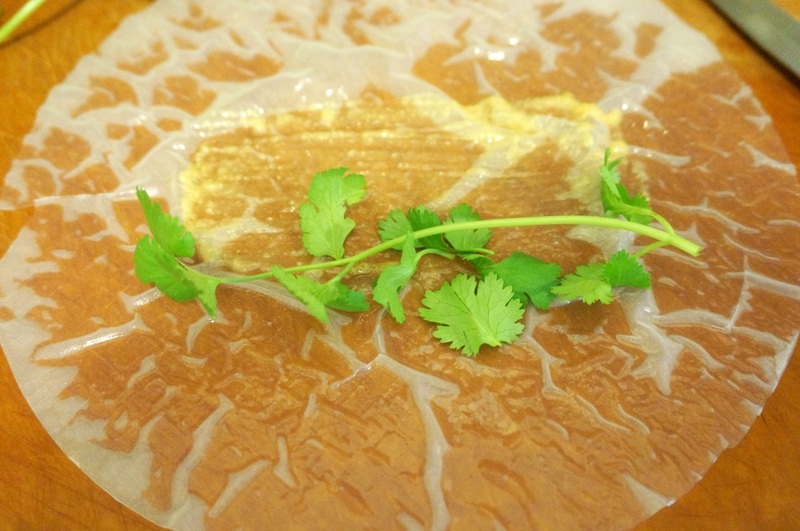 Place the wet rice paper on a flat surface. Brush some of the miso mixture on the rice paper. Add a sprig of cilantro, tofu (3 full strips and 3 half strips), then pickled vegetables. Fold the bottom part of the rice paper up and over the ingredients. Then fold the sides in. Then roll the rest of the roll up. Roll the whole roll up and down a few times on a flat surface to make the roll round. Cut the roll in half and serve. 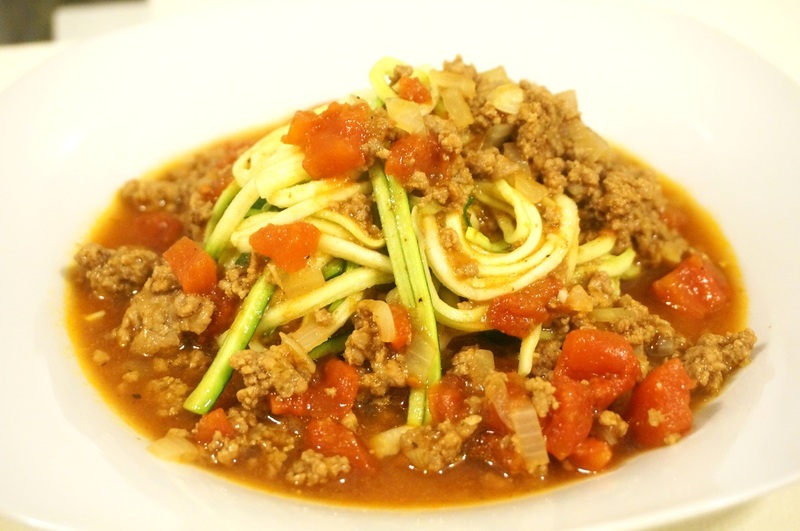 ZUCCHINI Noodles with a MEDITERRANEAN Bolognese Sauce + a giveaway! Having a plate of spaghetti with bolognese sauce reminds me of my childhood. My brother and I would have a contest to see who could twirl the most noodles around their fork and stuff it in their mouth when our mother wasn't looking. Of course, I was always the champion. What I enjoyed most as a child about eating spaghetti with "bolognese" sauce was sticking a fork in the sea of spaghetti and twirling the fork until it would no longer pick up any more pasta. And then occasionally, little bits of ground beef would get tangled in the cocoon of pasta and it would be a special surprise. It's silly, I know, but I found it to be it so much fun (and still do)! And then I found out that these forks full of fun contributed to an epidemic of metabolic dysfunction and diabetes in our culture. Bummer. 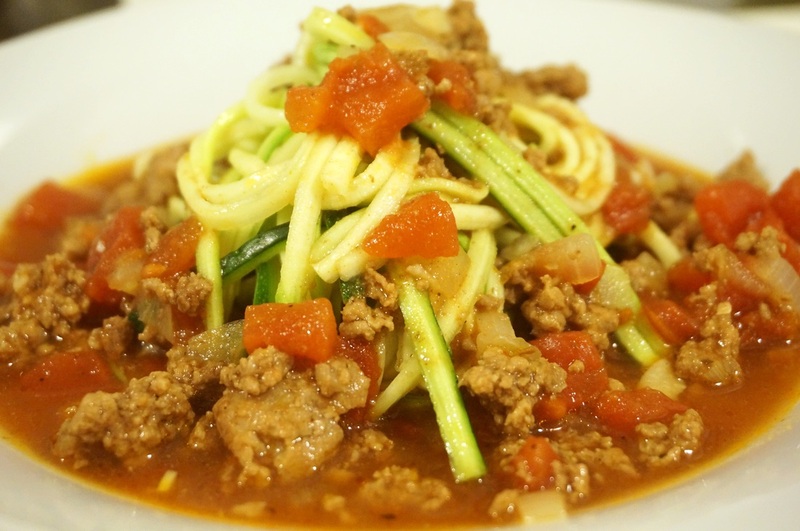 Looking for an alternative to pasta, so I could continue my twirling spaghetti obsession, I came across zucchini noodles. I know, I'm so far behind in this discovery, but better late than never! Here is my version of zucchini noodles with a Mediterranean bolognese sauce made with this wonderful julienne peeler from Precision Kitchenware. I am giving away this julienne peeler to 3 lucky readers. To enter the giveaway, leave a comment to this post and include your name and email (your email will not be displayed publicly). US entrants only, sorry! Check out and place a comment on my Julienned Daikon with Smoked Salmon post for an extra chance to win a julienne peeler from Precision Kitchenware! To give the zucchini noodles more of a pasta texture, I lined a baking sheet with parchment paper and baked the zucchini noodles in a 350°F oven for 10 minutes. If you want the dish to look more like real pasta, then you can discard the skin of the zucchini and just julienne the flesh. I called this sauce a Mediterranean bolognese sauce because I added cumin and omitted the diced celery and parmesan cheese, which are normal ingredients for a traditional bolognese sauce. 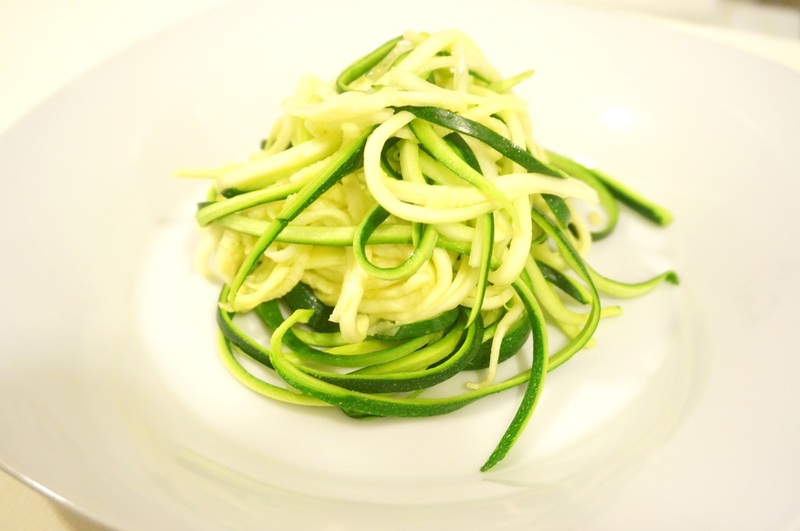 To plate, swirl some zucchini noodles around tongs and place in the middle of the plate. Spoon the bolognese over and around the noodles. The best thing about zucchini noodles is that it can sit in the sauce for a couple of days in the fridge and not get soggy. Heat a 3 quart pan over medium heat. 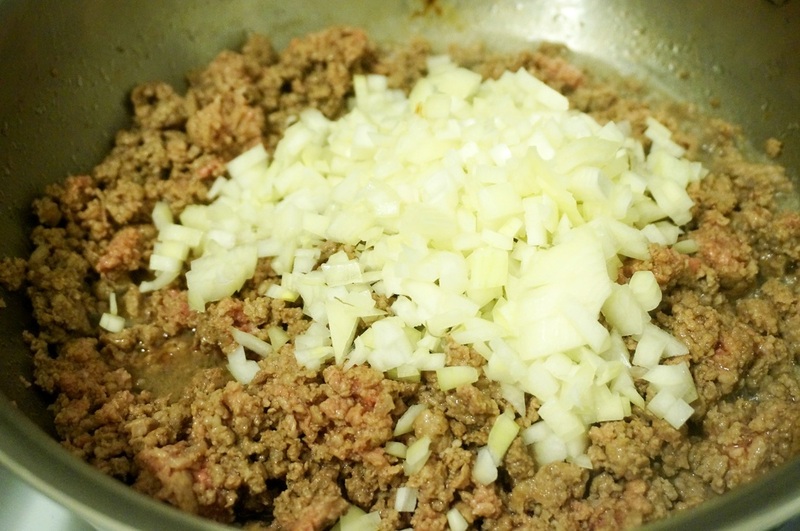 Add the ground meat and stir frequently to break up large lumps, 5 minutes. Add onion, garlic, and cumin, and stir and cook for another 5 minutes. Add the crushed tomatoes, tomato paste, and beef broth. Simmer, uncovered, for the sauce to reduce. About 20 minutes. While the sauce is simmering, preheat the oven to 350°F. Wash and pat dry zucchinis. Cut of the tips and ends. 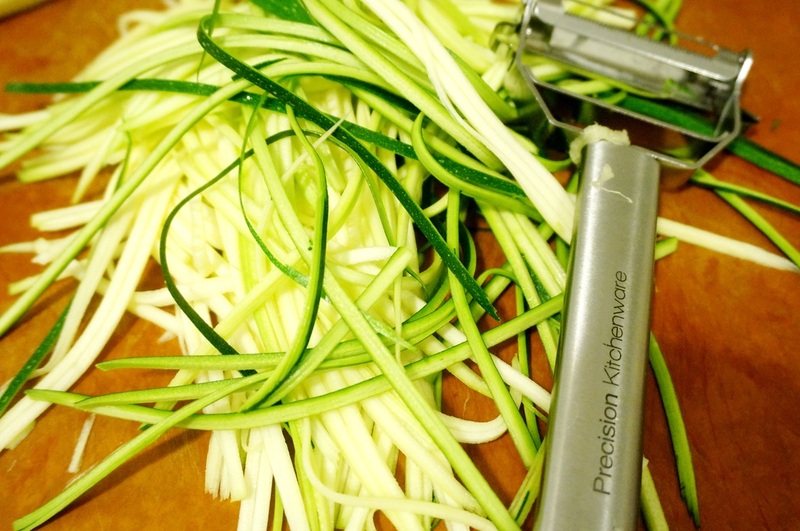 Using a julienne peeler, slice the zucchinis lengthwise. 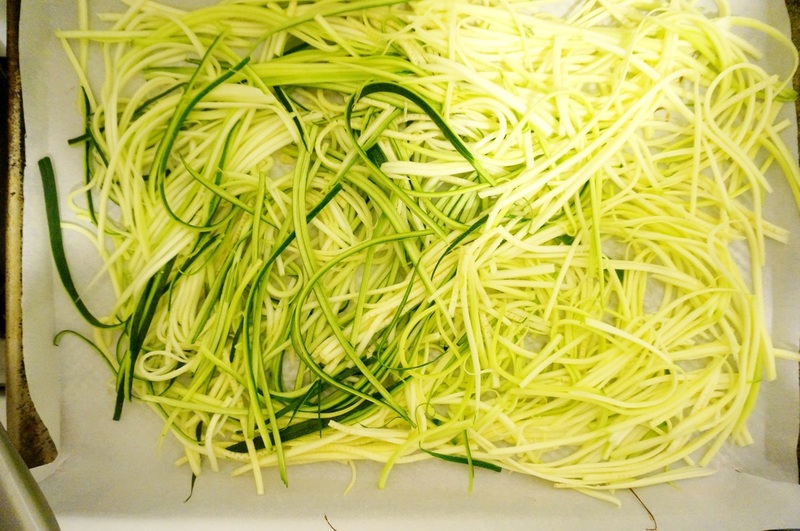 Line a baking sheet with parchment paper and place the zucchini noodles on top and bake for 10 minutes. Add salt and pepper to the bolognese sauce. 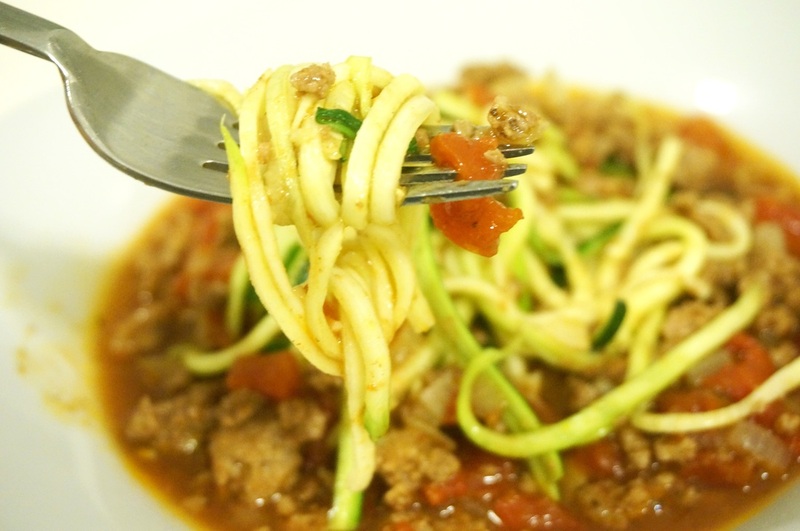 Using a tong, swirl some zucchini noodles around it and place the noodles in the middle of the plate. Ladle the bolognese sauce around and over the noodles. 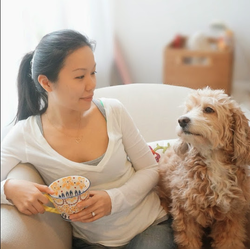 middle-woman to finding amazing recipes! their approved recipes with all of you!